After creating project - java module with Tapestry support (or any other project which includes tapestry in it) I can't add anything from tapestry menu (page, component or mixin) - it is gray. I selected "Generate startup project" in "New Tapestry support", but I don't get it created (src folder is empty, no .tml files and no web folder created). 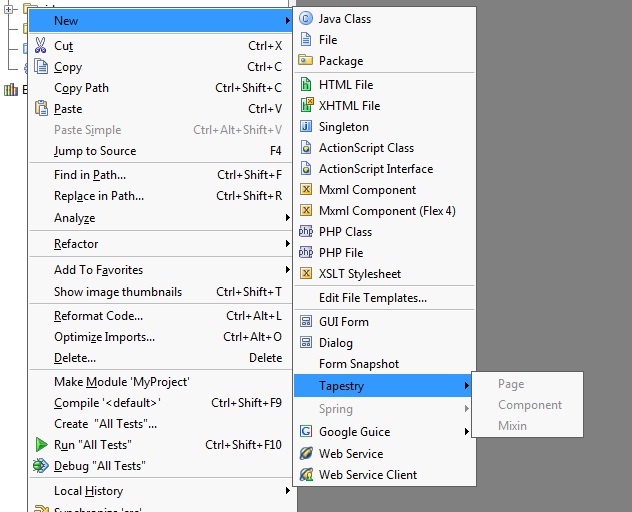 I have libraries and everything for tapestry 5.1.0.5 and I can't add anything from tapestry menu (page, component or mixin), even if I create it as maven module with tapestry archetype. 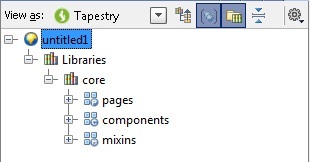 If I switch to tapestry view, It won't show anything (even if there exists some files (.tml) created by maven archetype). .tml extension is associated with Tapestry template file in file types. tml extension is associated with Tapestry template file in file types.